Toronto is in the middle of the annual "deep freeze" part of the winter — where air masses migrate south from the Arctic and make the local temperature very cold. We've been in the -10C to -15C range for a week, with the wind chill making it feel more like -30C. It's finally warmed up to around 0C today. But that got me thinking of slippers. My hairdresser has a basket of slippers by the salon entrance so people can remove their wet, slush-covered boots at the door and wear a pair of dry, comfy slippers while they're getting their hair done. I mentioned it to my chiropractor, since her office has hardwood flooring, and proposed I make some slippers out of leftover yarn for the waiting room. Last but not least, they had to appeal to people who are not necessarily into the whole "handmade" aesthetic. I didn't want anything that gave a first impression of, "ooh, saw something like that at a charity sale once. It was really ugly." There are lots of slipper patterns around. Remarkably few of them meet the criteria, especially that last one. And while usually I'm all for vintage, a lot of these patterns were good reminders that not everything about the 1950s and 60s was chic and elegant. My first attempt were some "ballet flat slippers" that came out looking like Archie Bunker's grandmother made them as something for someone to wear as punishment. Partly it was the colour scheme I chose, partly the textured stitches (which leave big holes between rows when worn). 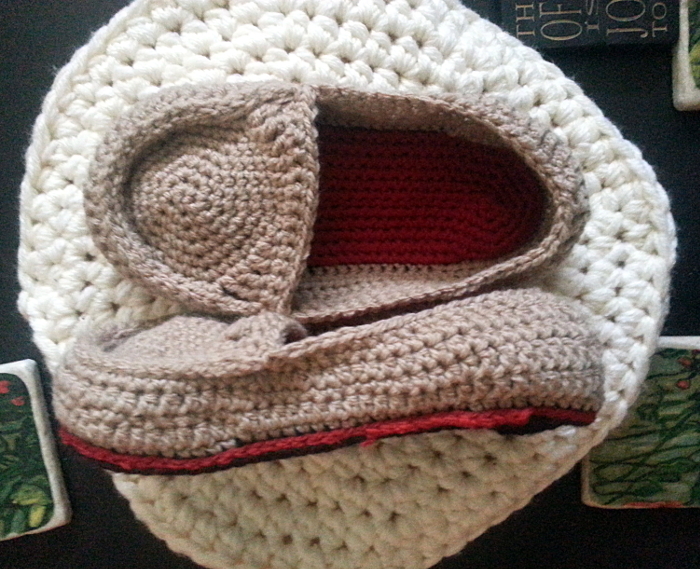 Also, even though the slippers were entirely crocheted, they didn't feel very substantial. I could see the soles wearing out very quickly. Bottom line was, I just didn't like them. So they got ripped out, and I went pattern hunting some more. I like how the inner sole colour peeks out just below the upper. The pattern came in a wide range of sizes, and the results are shoe-like enough to calm everyone but the most pro-factory slipper-wearers. Being crocheted, the yarn consumption is relatively high for the results. That's fine for the soles, which need the fabric density anyhow, but I wondered if there were other options for the uppers. I tried making a basic "kimono" upper, and was pleased with the results. Funny thing: the inner sole and the stitching holding the two soles and the upper together are recovered yarn from those ugly slippers I started with. These got worked on in public a bit, and I got some nice compliments on the colour combination. Maybe it was the pattern all along, or maybe adding the red helps. The nice thing about the knitted upper is that it's just a plain rectangle, and only about twenty rows high, including the border. Although I think this prototype worked, next time I make slippers like these (um, next Tuesday night, most likely), I'm going to make the uppers about four rows higher so that the overlap at the front is more pronounced and so that there is slightly more coverage at the back of the heel. I made the knitted upper so that the stitch gauge was approximately the same as the stitch gauge on the crocheted soles. That way, when I was slip stitching everything together, I could count on matching one knit stitch to one inner sole stitch to one outer sole stitch. There was a little bit of easing when I got to the toe, but not much. The completion of the first pair of kimono slippers led me back to loafers. In the original pattern, you are supposed to make the top part of the toe box as a separate piece and then slip stitch it to the upper, easing to fit. It felt awkward to do, and was a little tricky since the toe doesn't actually fit in place. Now I just have to make enough slippers to fill the basket!